The Pokemon Company has unveiled a new lineup of plushies featuring Pikachu and Eevee, as a huge push for Pokemon Let’s GO Pikachu/Eevee. The new lineup of plushies is called “Seasons Pikachu & Eevee”, so we can assume one plush from this series will be released for every season. 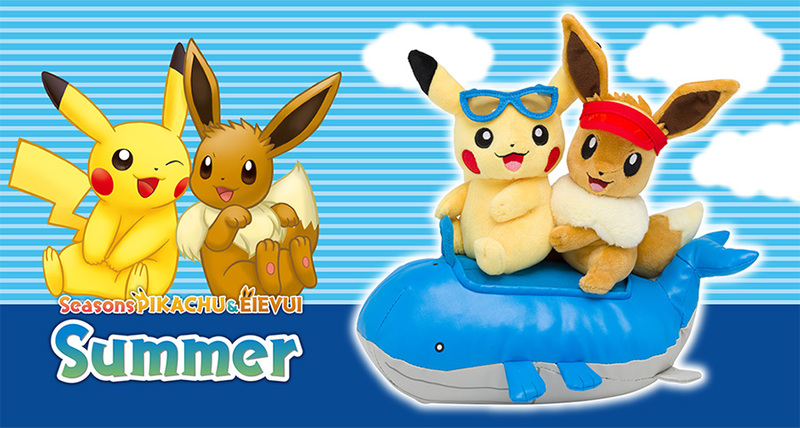 The first plush features Pikachu and Eevee riding on a 30cm long Wailord float, enjoying summer. Seasons Pikachu & Eevee Summer plush will be released at Pokemon Center locations and Amazon Japan on July 7, 2018 for 3000 yen (exclusive of 8% sales tax). We’ll let you know once pre-orders go live.